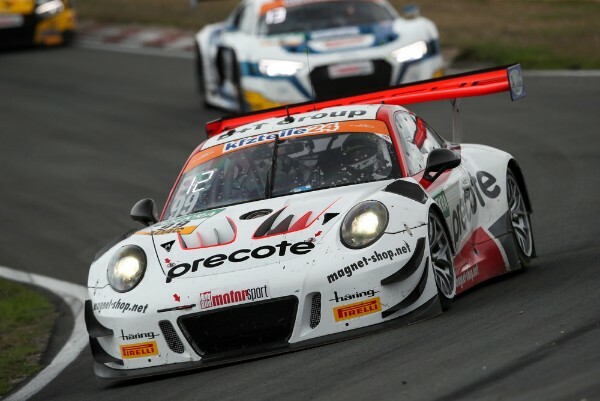 Luck was not with the Porsche customer teams at round nine of the ADAC GT Masters in Zandvoort: In a race full of incident and drama, Porsche Young Professional Mathieu Jaminet and Robert Renauer of team Precote Herberth Motorsport finished twelfth. Sharing the cockpit of the second-best 500 hp Porsche 911 GT3 R for Saturday’s race at the coastal circuit, Klaus Bachler and Adrien de Leener took the flag in 21st place for KÜS Team75 Bernhard. Round ten of the ADAC GT Masters in Zandvoort takes off on Sunday, 19 August, at 13:08 hrs. The grid positions on the circuit at the North Sea are determined in a morning qualifying session starting at 9am. The race is broadcast live on SPORT1 as well as on the internet at http://www.sport1.de, http://www.adac.de/motorsport and http://www.youtube.com/adac. Contesting the “super sports car league” alongside Porsche are Audi, BMW, Corvette, Ferrari, Honda, Lamborghini and Mercedes-AMG.